When I think of Christ at the cross I can think of no situation in life that could compare to the passion that he had for his people – for me, for us - and the crushing sin that was heaped upon him. None of which he deserved. His entire life had been about love, sacrifice, doing God’s will and helping his fellow man. He did not deserve this day on the cross and we – we were not worthy. In November 2014, my mother started having problems with focus and memory. Concerns that went beyond just “getting a little older.” My mother paid the bills in her house and took care of my mentally disabled brother. She was also the guardian ad litem for my disabled niece. At 75, she had never stopped parenting my brother and my niece. She was a rock for our entire family. After Mom missed a few bill payments, began to drop sentences, and finally experienced a fall, we knew something was wrong and she needed help. We made plans for Bob to take over paying the bills, we started decluttering their home, and we would come and help out on weekends. We reached out to doctors to find out what was wrong. By spring break, after a second fall we knew that Mom and Bob needed more help than we could provide on weekends and holidays. Meanwhile, my own job was in jeopardy. As a school superintendent, my commitment to sound academics and integrity met with some resistance. In the end, it polarized the community did not make me a very popular man. Kelle and I needed to look into independent living, and possibly assisted living, and get Mom and Bob moved as quickly as we could. We found a lovely independent living community in Round Rock. A few weeks later we had them safely moved and settling into their new apartment. Mom and Bob could live independently, get nutritious meals and take care of each other. I could take care of my brother and my niece. On April 10, 7:19 am, Bob called me to tell me mother fell again, and she was on her way to the hospital. After days in the hospital. X-rays, blood test, and an MRI we had our answer. The lung cancer was back, and it was at the root cause of the problems mom was having. The Doctors said she had three to six months to live. After a couple weeks in the hospital and regaining most of her cognitive abilities, mom decided she wanted to rehab. She wanted to regain some strength and spend the next few months with family. When she was able, we moved her to a rehab facility to begin rebuilding her strength. We thought we still had time with her. She never recovered. By the end of April, the school district and I had parted company. 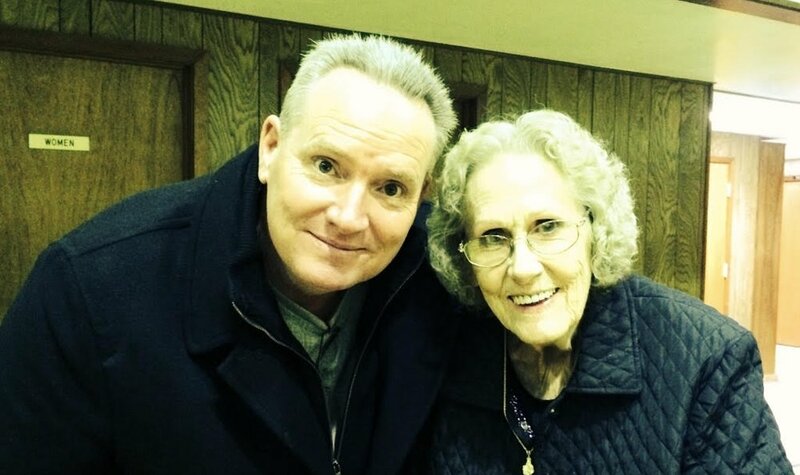 On May 5, 2015, my mother, who had lived a wonderful life and loved her family fiercely, passed away after battling cancer for the 3rd time on her life. I, on the other hand, was crushed. My family felt crushed. Kelle and I look back on this time, and we know that Christ carried us through this crisis in our lives. We hurt, we struggled, we cried. We prayed daily for answers. There were many times when we felt powerless and helpless. Yet we always felt God’s presence. We took comfort in him. We learned full well that we were not in control! We literally turned everything over to him. He was working in our lives. Loving us, guiding us, and leading us to a better place. We came back home to this church. We rekindled old friendships and made new friends. We were wrapped in a blanket of love. At home in a church that lives love. Kelle found a job. We found a place to live. We began healing. Turns out, my commitment to doing the right thing became something of legend. It played a big part in me landed my current job, the best job I have ever had. I look after my brother and my niece. We have a lovely home and a beautiful church family. God is good. Thank you, Jesus!